Veteran’s Day is all about honoring the men and women who have served our great country, and this weekend we have plenty of opportunities to do just that. 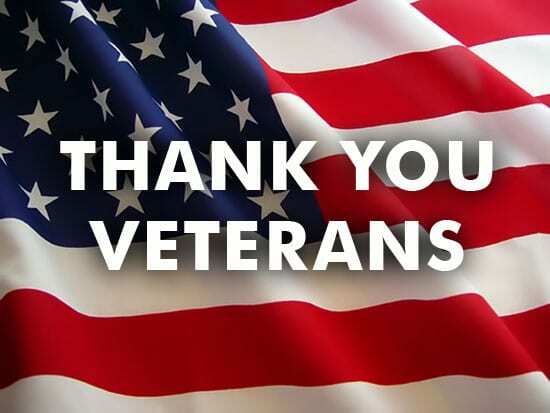 These brave men and women have fought for our freedoms and the preservation of our unalienable rights of life, liberty, and the pursuit happiness. There are parades, ceremonial events at Veterans cemeteries, family, faith-based, and government activities to show respect for these American citizens. It is our responsibility to honor these individuals and demonstrate our continued support of and for them as they relive their memories of service-some good, and some not so good, rife with injuries and medical conditions that haunt their lives, yet proud to be an American and to have served our country. “I, too, sing America,” said the Harlem Renaissance poet Langston Hughes, and this is the time for all American citizens to recognize and work toward peace in our spirits and in our lives. I believe we can do better in stopping the senseless violence we are experiencing throughout the country and the world; meaningless killings of our children and youth, mass murders at churches, drive up attacks, law enforcement assaults on African American men, road rage, racist acts, business and home burglaries, and so on. This is not the way to pay respect to our veterans, our founding fathers, and those who gave their lives for our freedoms. Their sacrifice was not for these senseless acts. Our teenage daughters should not be gunned down in public housing and other neighborhoods. African American men should not be shot by those sworn to uphold the law; children should not be victims of domestic violence; the elderly should not be hood-winked, bamboozled, or taken advantage of by swindlers; and adults and children should not be the victims of drugs, as well as, opioid medical mismanagement. To my brothers, I propose that we, as men, stand up for our families and this country. We should galvanize our strengths to respect, protect and honor our women, children, the elderly and self. We must be influencers and atmosphere changers for the betterment of life. Often I have written that we should “Stop the Killing,” and focus on love, peace, and honor. These are heartfelt words with simple actions. They work. Showing loving actions with kind words, peaceful thoughts, and deliberate acts of kindness such as smiling instead of a stern glare, offering a hand to a senior citizen rather than letting a door slam in their faces or not blowing your horn or making a vulgar gesture when a fellow driver pulls in front of you. These are acts of kindness. We also need to show that we, as men, love our families, biological and otherwise, and will stand boldly to show support for them, and protect them from harm, danger, and yes, even death, while also protecting ourselves. It is time! On November 18, from 10 a.m. until noon, we will hold a “When Men Pray” Service at Greater Bethel AME Church at 1300 South Street., in South Nashville. We must Be Bold, Be Proud, Be Vigilant, Be Strong, and stand up to demonstrate we love our children, neighbors, community and ourselves, as well as our country, and of course the God we serve. Together we can, we will and we must win the war against crime for each of us and generations to come. Pastor Howard E. Jones, Jr.., is the Senior Pastor of Fairfield M. B. Church in Goodlettsville and assistant principal at J. F. Kennedy Middle School, a part of the MNPS system. He is a candidate for TN State Senate, District 19.